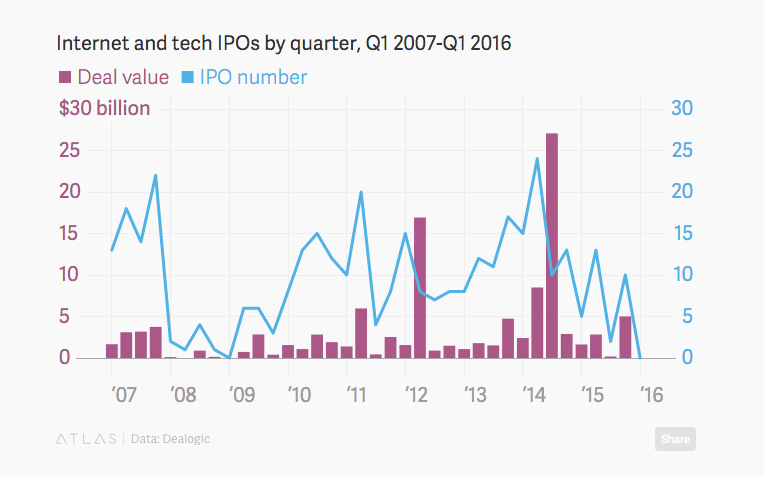 tl;dr: 2015’s tech IPOs are nearly back to where they started. That’s a big improvement. 2015’s technology IPOs took a beating early this year. In the opening months of 2016, the group in aggregate was down double digits from both its original IPO price, and first day close. January and February were rough enough on the recently-public that a grand total of zero United States-based tech companies went public. None. Happily for the technology industry, things are looking up a bit. 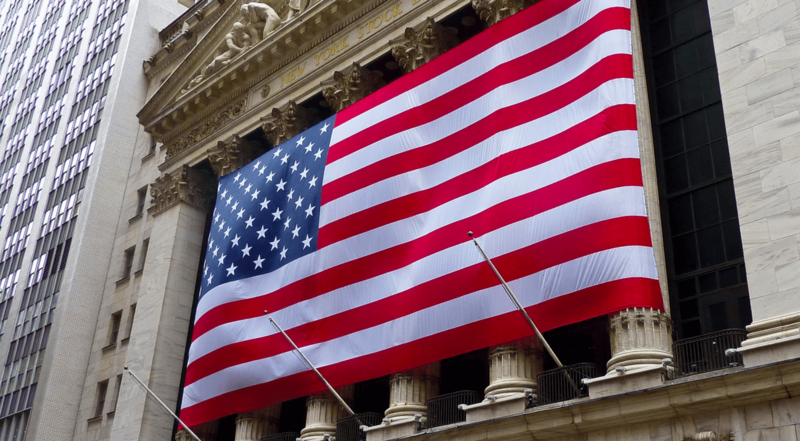 At the end of the first quarter, tech companies that went public in the United States during 2015 are nearly back to their IPO price, averaging a 0.75 percent decline. From their first day closes, however, the same group of firms is still off an average of 23.36 percent. Bad? Sure, but the last time that we checked things were much worse. Mattermark reported in mid-March that things were looking up for many technology companies, who had seen their share price recover from record lows. Measuring up from 2016 local minimums, companies like Square, Shopify, Apigee, and Etsy were all up more than 40 percent. That wasn’t enough to unfreeze the IPO market, but it was enough to repair some investor sentiment. The impact of that rally is measurable. At the end of February, 2015 tech IPOs were down an average of 31.72 percent compared to their first day close, a far, far higher number than our final 23.36 percent decline that came in at the end of the quarter. Still, keep in mind the magic number of zero — how many tech companies went public in the United States during the first quarter. 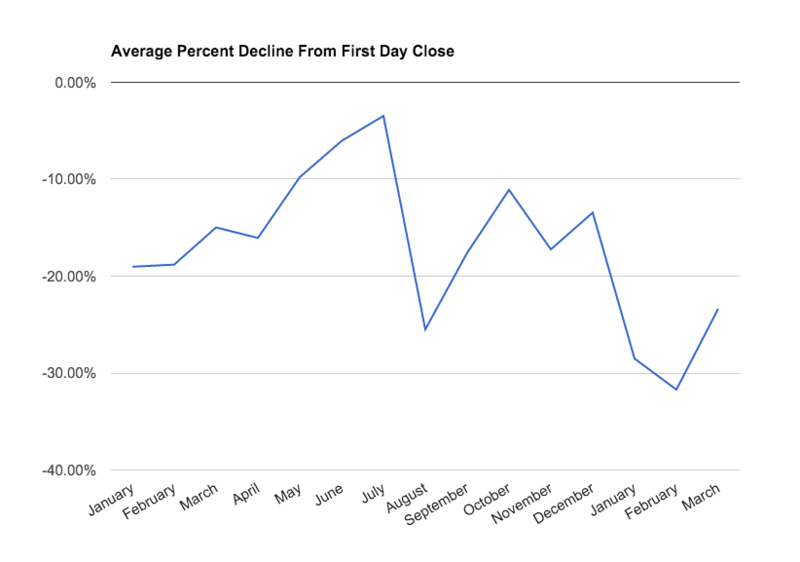 To get our minds around how tough things have been for 2015 IPOs, here’s a chart showing their average decline over since January of last year, measured from their first day close to their final price at the end of the first quarter. You can see two major declines. The period around August, and the start of this year. The result of those two rapid deteriorations was material impact to venture capital sentiment, albeit temporarily. Put simply, when tech stocks get their asses kicked, private investors start to sweat. According to the people paid to watch the IPO market, no tech companies are currently on their road show. That means that in the short-term, we likely won’t see many new offerings. The second quarter will be light, which isn’t encouraging. Why the hell are we talking about last year’s IPO crop today? Because there is no 2016 IPO class to date. So, to see where we are heading, all that we have is what we did before. That’s the story in a nutshell. At some point I feel like you and I are together today to kick this dead horse one more time, but things keep being odd. Money is flowing from fresh venture funds into early-stage companies. Some startups are still raising nine-figure rounds, and unicorns are still unicorns. But liquidity is low and many unicorns are going to need to raise again this year. How that all ends cleanly is beyond me, and I wouldn’t bet that it all goes well. 2016 could very well be the year that we revert to the mean. And that means a lot of people are going to be stuck between a down round and death. We’ll see. Featured Image via Flickr user Michael Zanussi under CC BY 2.0. Image has been cropped.